I’m here to offer a few thoughts on money markets and the implementation of monetary policy. Because of the large size of the Federal Reserve’s balance sheet, the staff at the Federal Reserve spent the past several years developing a new and innovative framework to control money market rates, and working to increase the amount of data we receive about trading in those markets. In my remarks today, I will review the performance of this new framework and discuss key insights from those new data collections. Implementing policy in this new way has required a significant shift in the staff’s analytical focus, toward quantitative, data-driven analysis of money market structure. This work was accomplished by a large roster of highly talented staff at the Board of Governors, the New York Fed, and elsewhere in the Federal Reserve System. Of course, the development of this new framework entailed frequent interaction with the Board of Governors and the Federal Open Market Committee (FOMC), which are responsible for the tools used to implement monetary policy. I’ll focus my remarks on a few key questions. Finally, what questions remain, and what can be done to learn more about the issues they raise? These include the level of capacity required in the Federal Reserve’s reverse repo operations and the consequences of changes in the regulatory rules for banks and money funds. As always, these views are mine alone and do not necessarily reflect those of the New York Fed or the Federal Reserve System. Why are we following a new approach to implementing monetary policy? Back then, a typical day on the Desk focused on forecasting the demand for reserves created by reserve requirements and other sources, and projecting autonomous factors affecting reserves. 9, 10 With very small amounts of excess reserves in the system, there was a straightforward relationship between rates in a range of money markets. Thus, the Desk was able to target a rate in one part of the unsecured market by conducting small secured operations as needed with primary dealers. In many countries, and in theory, a standing facility that pays IOR provides a floor on interest rates. The reason is simple: if a private counterparty can invest cash at the central bank, then given the safety and convenience of this investment, it will dominate any other overnight investment at that interest rate. Further, if banks can acquire funds in the wholesale market at rates below IOR, then competition for these funds will bid up these rates close to that paid on reserves. So, why did the Federal Reserve not follow this approach of large-scale reserve draining? As the balance sheet continued to grow as a result of asset purchase programs, it became apparent that such reserve draining operations would have been very large in comparison to the size of private money markets. As a result, they probably would have had lasting effects on the structure of those markets—for example, by reshaping the structure of term money market activity according to the structure of the Federal Reserve’s operations. These lasting effects could have been especially large if the balance sheet did not run off quickly. For this reason, the Federal Reserve instead pursued offering an overnight investment opportunity that could, with sufficient capacity, intensify competition in money markets and, without necessarily draining reserves, enhance the transmission of IOR into other overnight money market rates. This approach entailed a twist on a traditional Federal Reserve tool, reverse repos: Instead of running quantity-based, term operations aimed at altering reserve levels, the Desk would run interest-rate-based overnight operations aimed directly at influencing market rates. At this point, you might have a question: from late 2008 to late 2015, the federal funds rate traded well within the FOMC’s target range of zero to 25 basis points.22 Shouldn’t this have been conclusive evidence as to the ability of the operational framework to provide sufficient control of interest rates? As a result, while the pre-liftoff testing suggested that the tools were likely to work well, it wasn’t possible to determine with complete certainty the extent to which market rates were driven by the tools or by ZLB effects. So we couldn’t completely rule out that the federal funds rate and other money market rates might not go up one for one with rises in administered rates. One might also worry that money market rates might not move together as rates rise, meaning that, for example, a disconnect might emerge between secured and unsecured rates, or between overnight and term instruments.24 Either situation could result in impaired transmission of monetary policy into broad financial conditions. To summarize my conclusion about the performance of the operating framework to date: I am extremely pleased with what we’ve seen so far. In discussing why I view the framework as effective, it’s helpful to start by explaining what it means for the tools to work well. I think about this issue through three lenses: interest rate control, avoiding unintended impact on the structure of the financial system, and avoiding financial instability. I’ll touch on what each of these mean, and then I’ll review the quantitative evidence since liftoff on how well things have gone. Clearly, interest rate control is the paramount objective. It is of great importance that the public is confident that the federal funds rate will be, on average over time, within the target range set forth by the FOMC, and that other money market rates will continue to move closely with changes in the federal funds rate. This way, expectations for the FOMC’s future policy stance will be properly incorporated into the term structure of interest rates, and thereby appropriately affect broad financial conditions and the broader economy. We have instituted a data-driven, cross-market framework for evaluating interest rate control. In unsecured markets, we gather daily, transaction-level data through a new Federal Reserve statistical collection called the FR 2420. These rich data give us much greater insight than we had before the crisis about how these markets are structured, which is important to developing and maintaining an operating regime based on improving competition among borrowers in money markets, in the context of a large amount of reserves and substantial ongoing regulatory and business model changes. Monetary control does not stop at the effective federal funds rate: The Federal Reserve also wants to ensure that the stance of monetary policy is passed through into other money market rates. For example, we evaluate such transmission in the Treasury tri-party repo market, the market in which ON RRP is conducted, by collecting similar trade-by-trade data from clearing banks. In addition to these overnight markets, we pay close attention to the Eurodollar market, which I’ll address later, as well as term money market rates. A second lens for evaluating the operational framework is the extent to which it avoids creating incentives that might result in undesirable changes in the structure of the financial system. This means that the framework shouldn’t have lasting unintended effects on how people invest their money or on how financial institutions interact with each other. The Federal Reserve is operating the ON RRP on a temporary basis, primarily because the balance sheet is currently large. The FOMC’s policy normalization principles and plans make the temporary nature of the ON RRP clear by stating that it will be discontinued when it is no longer needed to help control the federal funds rate.26 This intention was noted again in the minutes to the January FOMC meeting. As a result, we expect that firms would not make structural changes in how they operate in response to the ON RRP, to avoid the cost of unwinding those changes when it is discontinued. The intention of the FOMC to impose an aggregate cap on the ON RRP, as described in the January minutes, will mitigate this risk. We closely monitor industry structure and fund flows to detect whether the framework is having any unintended impact. For example, we watch banking data and money fund holdings to see if savings are shifting between the two, because if such a shift had to reverse as we wound down the ON RRP, those flows could potentially create costs to the firms concerned and also unnecessary problems for market functioning. 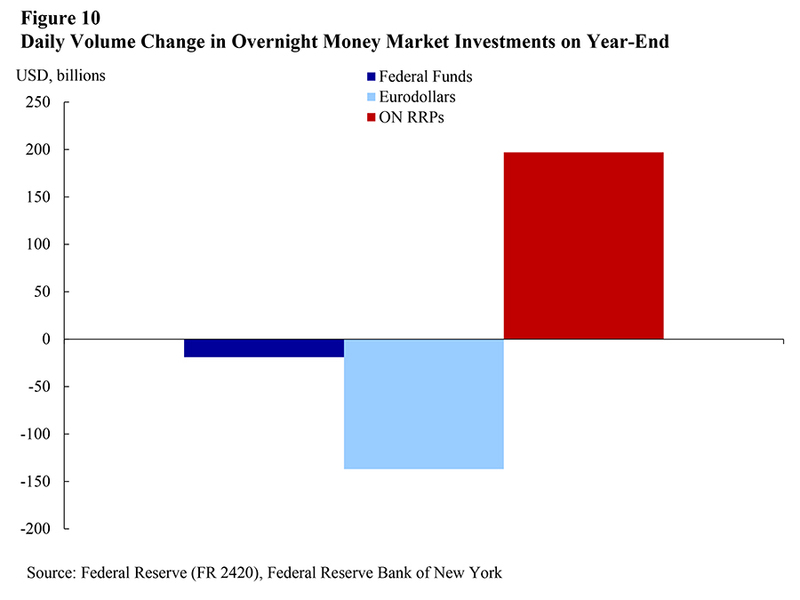 We also keep track of prime money funds converting into government-only money funds, because if they do so on the mistaken impression that the Federal Reserve would provide a risk-free investment opportunity indefinitely and on a very large scale, they might later have to unwind that change when their error became apparent. The third lens for evaluating the framework is the extent to which the framework avoids augmenting risks of financial instability. In particular, the framework shouldn’t create a risk that, in times of stress, money market lenders will rapidly disintermediate their usual counterparties and come to the Federal Reserve instead, such as through the ON RRP facility.27 Of course, flight-to-quality effects existed in financial markets long before we put the new framework into place—what I’m referring to is a situation where the framework facilitates those effects or makes them larger. We address the risk of sudden surges in take-up in a couple of ways. For example, we can employ vigilant market monitoring to detect any such shifts and allow the FOMC to formulate a response. We also use per-counterparty caps, and can use an aggregate cap. Now, let’s discuss what the data tell us about how well the framework performed. 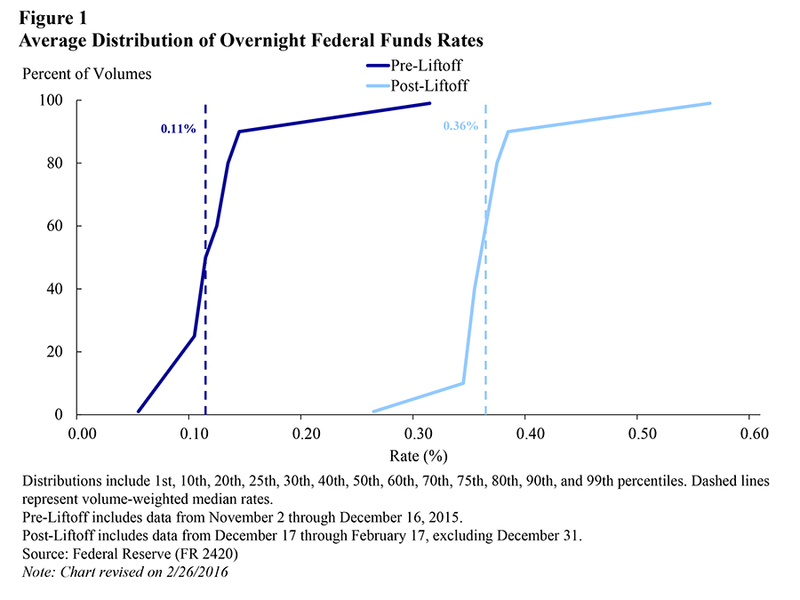 The distribution of traded rates in the federal funds market, shown in Figure 1, essentially made a parallel shift higher after liftoff. These data are drawn from the new FR 2420 data collection I discussed earlier, and they show an average over all days from liftoff to this past Wednesday, leaving out December 31. Nearly all trading occurred within the new range—it’s normal for there to be a little bit above the range—suggesting that our framework was broadly effective in moving traded rates upward. Because traded rates moved upward in this way, we have so far achieved an excellent level of control over the federal funds rate. 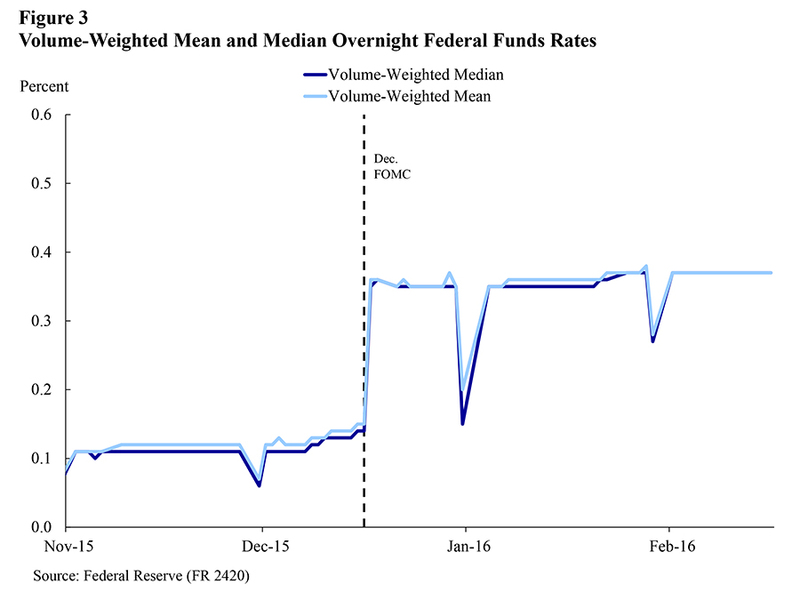 Since December 17, the day after the FOMC meeting, the effective federal funds rate, calculated under its current methodology as a volume-weighted mean, has traded within the FOMC’s new 25-to-50-basis-point range on all but one day, which I’ll come back to. This is shown in Figure 2. The rate has averaged around 36 basis points, about 25 basis points above its average level over the analogous year-ago period, when the target range was zero to 25 basis points. Our recent experience has confirmed the expectation that the transition to the median in March will result in little overall impact on the level of the effective rate over time. Figure 3 shows a time series of the mean and median rates computed from the FR 2420 data. As you can see, they remain quite close to one another. 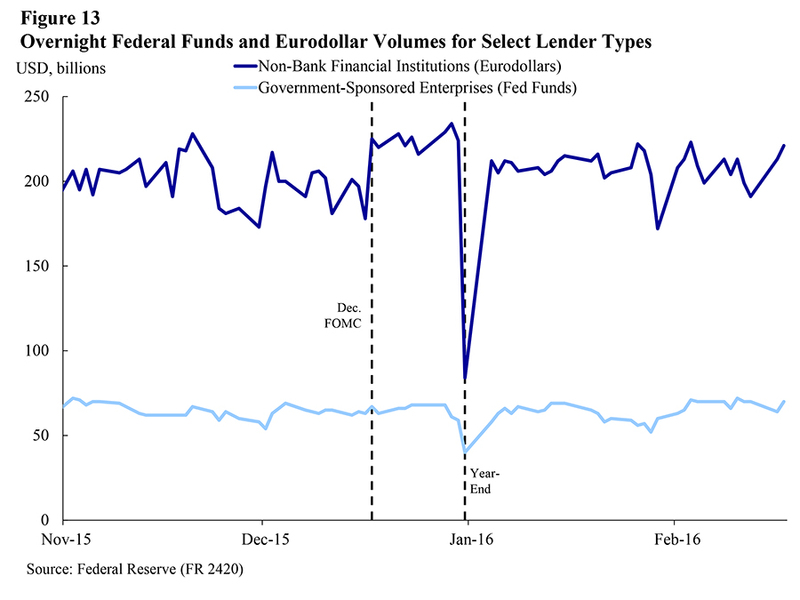 The Eurodollar market is considerably larger than the federal funds market. 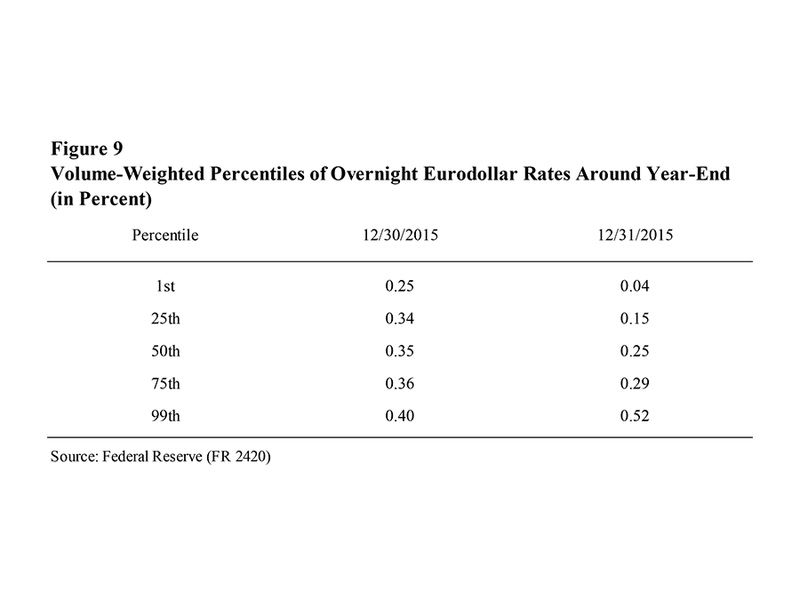 According to FR 2420 data, on average in the last two months of 2015 there was $233 billion of overnight borrowing in the Eurodollar market; in contrast, over that same period, there was $70 billion overnight borrowing in the federal funds market.33 I’ll show some data on the composition of activity in these markets a bit later, but it’s worthwhile noting that many of the Desk’s nonbank counterparties, such as the money funds, are active lenders in the Eurodollar market. 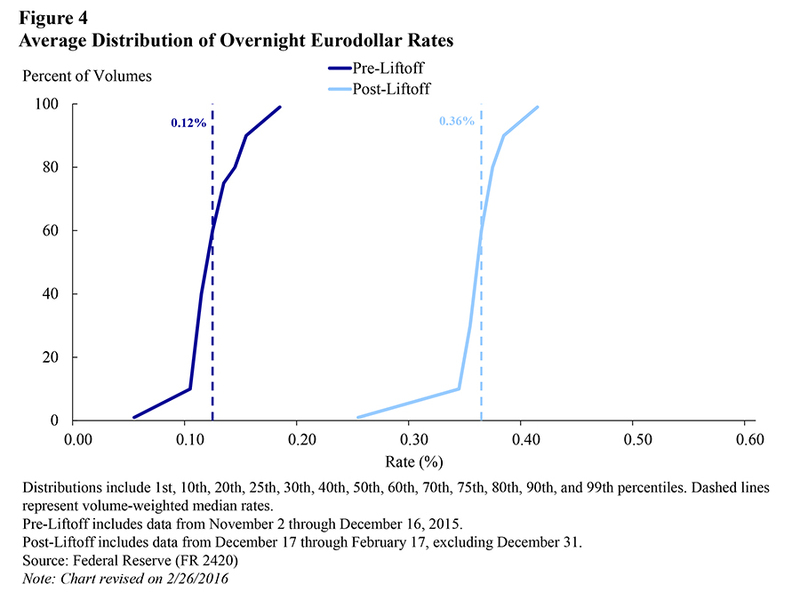 We observed a similar response in yields in the Eurodollar market as we did in the federal funds market, with the distribution of traded rates making a parallel shift upward of about 25 basis points, as shown in Figure 4. 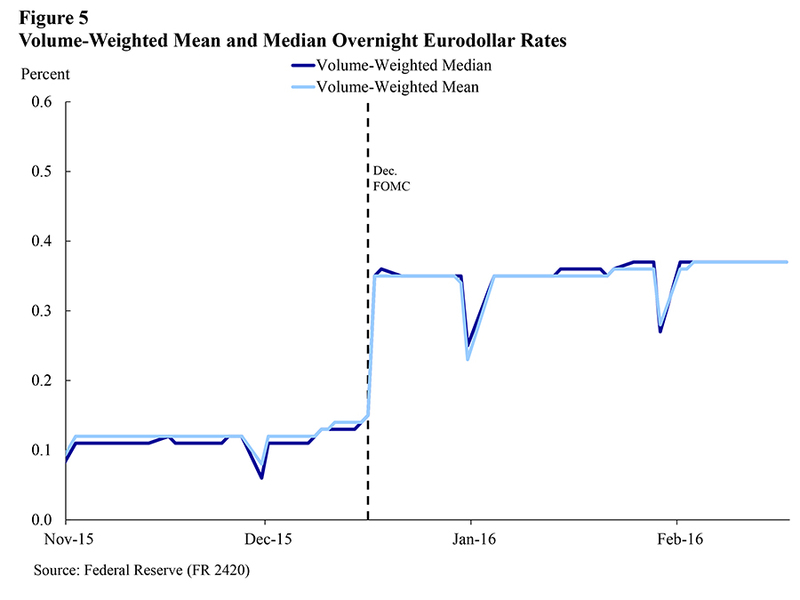 Since liftoff, the overnight Eurodollar volume-weighted mean rate as calculated from FR 2420 data, as seen in Figure 5, has averaged about 35 basis points.34 This is in line with the effective federal funds rate. The volume-weighted median, also shown in the figure, moved upward by a like amount. This is an encouraging development because it indicates that, as we have moved up from the zero lower bound, money market rates are continuing to move together. We can look into that further by examining the overnight Treasury repo market. Rates on these transactions as reported by the tri-party clearing banks, shown in Figure 6, exhibited a similar shift upward, although they settled modestly lower in the target range than they had in the pre-liftoff period. In part, this shift likely reflects the fact that the ON RRP offered rate was 5 basis points before liftoff—that is, 5 basis points above the bottom of the target range—and it is now set to 25 basis points, or the bottom of the target range. It also looks as though the increase in the federal funds rate passed through effectively into term money market instruments. Figure 7 shows the recent progression of rates on three-month Treasury bills and three-month commercial paper. 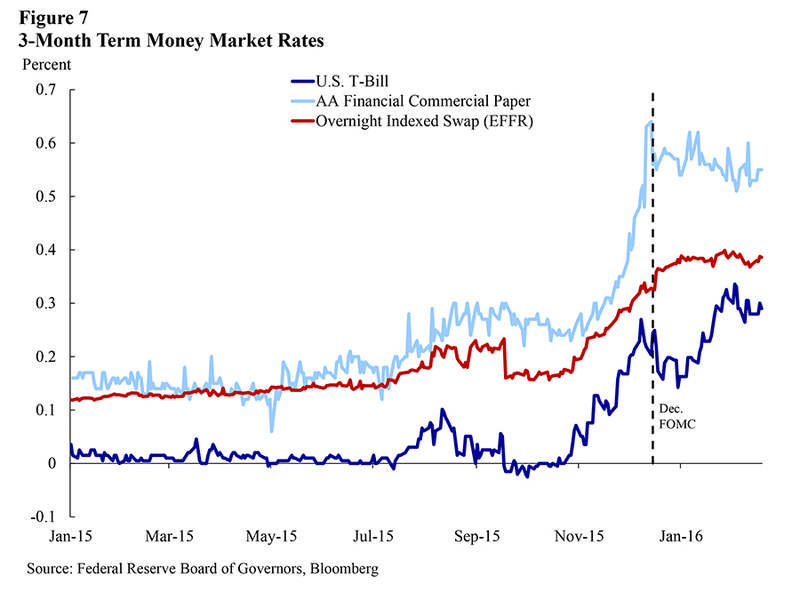 Also shown for comparison is a three-month overnight index swap quote for the effective federal funds rate. All of these rates rose going into the December FOMC meeting, which makes quite a bit of sense, given that most market participants expected the FOMC to tighten policy at that meeting.35 We also gather information about rates on term unsecured borrowing in our FR 2420 collection, and about term secured transactions from the clearing banks, and these data tell a similar story. 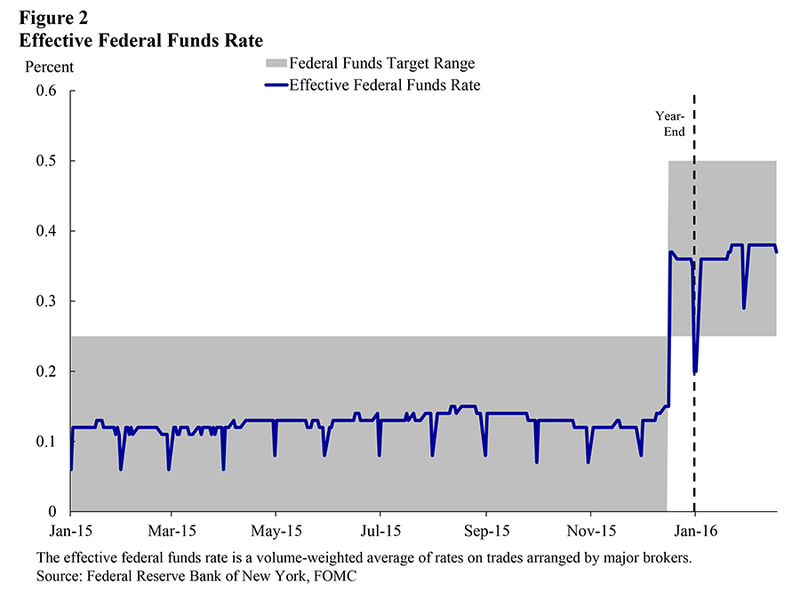 Now, I mentioned earlier that fed funds traded within the target range on all but one day. Let’s talk about that day, which was December 31. On that day, the effective federal funds rate, calculated as a mean from the FR 2420 data, printed at 20 basis points, 15 basis points below its prior-day value and 5 basis points below the FOMC’s target range. The median dropped a bit more, by 20 basis points to a level of 15 basis points. 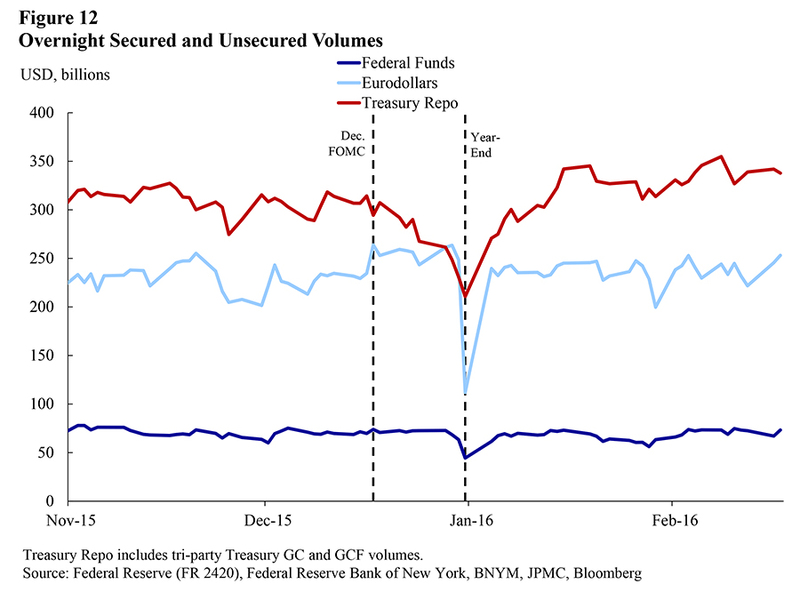 In addition, as shown in Figures 8 and 9, the dispersion of traded overnight rates in federal funds and Eurodollars increased on that day, with a substantial amount of trading activity at fairly low rates. These year-end effects were transitory, and the level and distribution of rates in the federal funds and Eurodollar markets returned to pre-year-end conditions on the following day. Although the effects were transitory and did not adversely affect policy implementation, spending a bit more time on this episode can contribute to our understanding of money market relationships. Why did we see the year-end drop in unsecured rates? Recall that the framework functions by creating opportunities for investors to borrow funds in money markets to earn IOR whenever there are significant differences between market rates and the IOR rate. On quarter-ends, the actual and perceived marginal balance sheet costs of a number of depository institutions increase as they publish financial statements and calculate regulatory ratios.38 These increased balance sheet costs mean that depository institutions borrowing funds in money markets to earn IOR must do so at a lower interest rate to account for these costs. Further, the reduction in balance sheet capacity can temporarily lower the bargaining power of lenders, again allowing borrowers to obtain funds at lower rates. These quarter-end effects, as measured by the effective federal funds rate, are likely to appear a bit larger when we switch in early March to a median calculation. As I mentioned, on December 31, the median fell a bit more than the mean did, 20 basis points in the median versus 15 for the mean. A larger relative decline isn’t unusual; averaging across the quarter-end dates in March, June, and September 2015, the median declined by 7 basis points while the mean declined by 6. The median declines more because it is, in most cases, a better measure of the center of the distribution of traded rates—an issue the Desk analyzed at some length in the technical note I mentioned earlier. This difference between the two might grow a bit more as rates move further from zero. 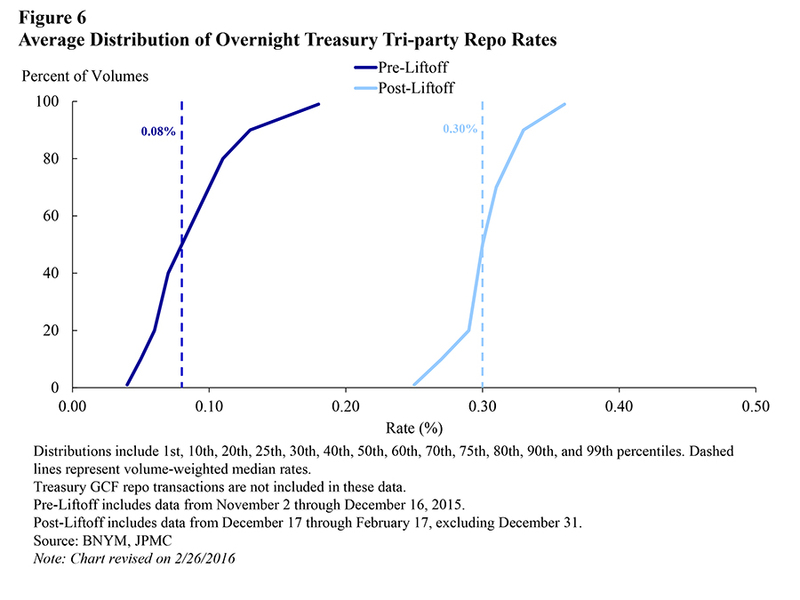 In secured markets, rates in the tri-party repo market on year-end were relatively stable. This makes sense, as ON RRP is a good substitute for tri-party repo with private counterparties, and therefore this facility forms a fairly firm floor on overnight repo rates for lenders that have access to the facility.40 As I’ll show in a moment, volumes declined in the private repo market, as is typical on quarter-ends. Turning to the second lens I noted earlier, we have achieved excellent control while avoiding any unintended change in the structure of the financial system. Figure 11 shows RRP take-up over time, grouped by counterparty type. Take-up, both in aggregate and at the counterparty-type level, has been stable since liftoff. Among the money funds shown in this figure, government-only funds make up more of the demand on typical days, with funds that can invest in a broader universe of money market instruments, called prime funds, accounting for the balance. This has also been stable since liftoff.41 Indeed, more recently, usage has come down as unsecured and secured rates have firmed some. Even with zero usage, the ON RRP facility could still be effective in underpinning the level for money market rates by supporting lenders’ bargaining power. In addition, as shown in Figure 12, lending volumes in secured and unsecured money markets have been stable, suggesting that the Federal Reserve’s facilities have not displaced activity in the private sector.42 Figure 13 shows activity in unsecured markets by select lender types. This shows that, post-liftoff, the composition of activity in these markets also appears to have been stable. Finally, I’d like to speak briefly to the third lens, avoiding financial instability. 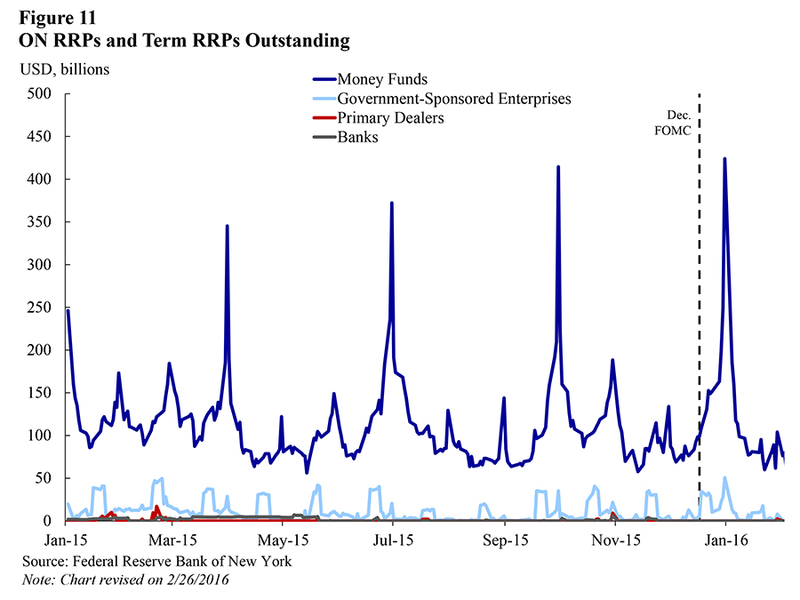 As you know, there has been quite a bit of volatility and risk aversion in financial markets lately, and there has been no corresponding surge in ON RRP demand. This continues to be an issue that the FOMC is thinking closely about, as reflected in the January FOMC minutes. We have learned a lot about the structure of our operations from our experience with liftoff. I will discuss a few of my observations. Let’s begin with quantifying the aggregate capacity limit. At the December meeting, the FOMC directed that the ON RRP’s capacity be “limited only by the value of Treasury securities held outright in the System Open Market Account that are available for such operations.” As a result, in practice, the ON RRP is currently being run with an aggregate capacity limit of around $2 trillion, which is far in excess of typical daily demand and well above the $300 billion capacity limit the facility had had since September 2014. As the FOMC made clear in the minutes to its March 2015 meeting, this elevated capacity was intended to ensure a smooth liftoff, but the absence of an aggregate cap is only temporary. This is why the recent January minutes included a discussion of when and how it will be appropriate to reinstate an aggregate cap. Our recent experience suggests that having reasonably high aggregate capacity can help improve control without necessarily encouraging greater use of the facility. When that capacity is great enough, money market lenders are confident that they will be able to place funds with us at the administered rate, even on financial statement reporting dates. That confidence empowers them to demand rates from their borrowers that are above the ON RRP offering rate. Conversely, when the capacity is perceived as low, lenders worry that they might not be able to place all their funds at reasonable rates. This means that they might accept relatively low rates in money markets. In addition, because of switching costs and other frictions as well as risk aversion on the part of lenders, rates can decline days or weeks ahead of a date on which the ON RRP is anticipated to reach its capacity, to levels so soft that lenders reallocate funds to the ON RRP.44 So, having a high capacity could actually reduce ON RRP take-up. But as I mentioned earlier, it isn’t clear exactly how high the capacity needs to be to achieve the confidence of which I speak, and the benefits of high capacity must be carefully balanced against the benefits of a tighter aggregate cap in terms of avoiding financial instability and unintended effects on the structure of the financial system. Looking at the recent data, it’s hard to precisely identify the extent to which the very high capacity, relative to the previous limit of $300 billion, helped to facilitate control beyond instilling confidence, as I discussed earlier. One tentative indication that high capacity may be playing an important role is that unsecured rates appear to have settled in about the same position relative to IOR as before liftoff, even though one might have expected the widening in the IOR-ON RRP spread and the lower support from the ZLB to result in some downward shift. The ON RRP also has a per-counterparty cap, which was, and is, $30 billion. It seems that the current level of the per-counterparty cap was also adequately large for perceived individual “headroom,” thereby supporting lender bargaining power. Figure 14 shows summary data on how frequently we receive large bids in our operations at the ON RRP and term RRP facilities. As you can see, we rarely see bids of more than $10 billion, and combined individual counterparty usage across overnight and term operations has never exceeded $30 billion. Recently, we learned a bit about the term RRP operations. We have been conducting these over quarter-ends as a way of providing additional RRP capacity. Additional capacity is available because term RRP operations are subject to a separate overall size limit, and because there is no per-counterparty cap in those operations. 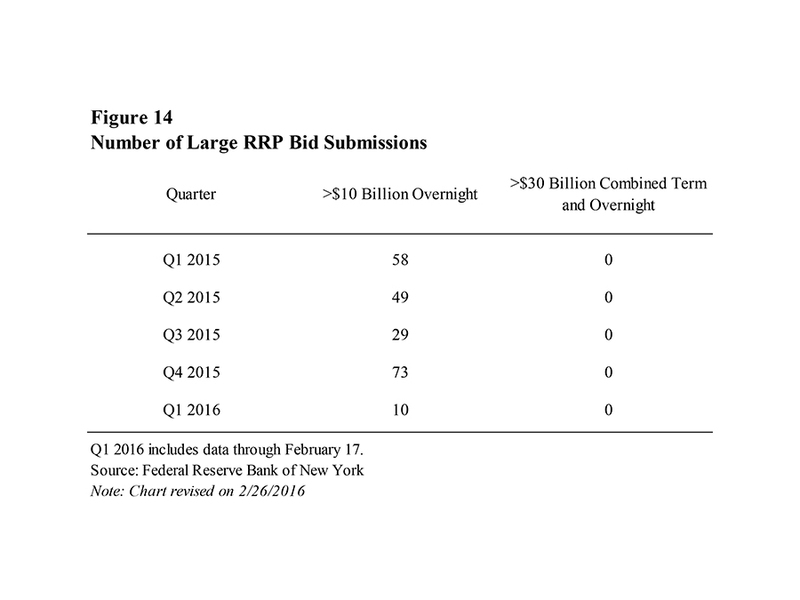 Counterparties appear to regard these as close substitutes for ON RRPs, and as shown in Figure 15, we’ve typically seen that overall RRP take-up, across overnight and term RRP, has been fairly stable across quarter-ends. 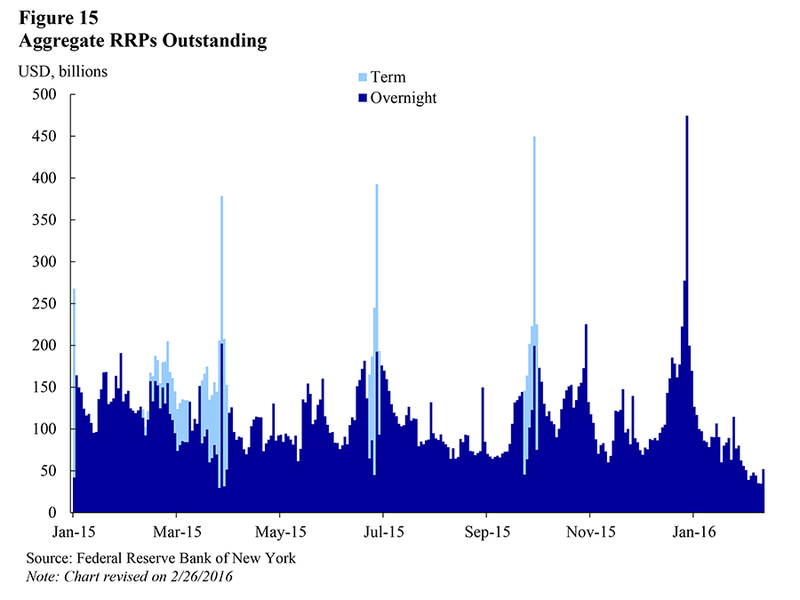 At this past year-end, there was essentially no take-up at the term RRP operations. The reason is that the aggregate and per-counterparty caps were sufficiently high that market participants were confident that they would not bind, and also because we conducted the term operations without any interest rate premium relative to the overnight operations. At prior quarter-ends, term RRPs were typically offered with maximum bid rates a few basis points above the ON RRP rate. The year-end experience suggests that market participants generally prefer overnight RRPs to term RRPs if they offer the same rate, and that, if desired, adequate control over money market rates can be attained without term RRPs, as long as there is adequate ON RRP capacity. The foreign pool is an autonomous factor affecting reserves and, as a result, in the pre-crisis operating framework, the Desk would have to essentially sterilize variations in the pool's size with repo operations. Accordingly, the interest rate on the pool was slightly below overnight Treasury repo rates in the market.47 To ease the Desk’s job in the daily forecasting of autonomous factors, tight limits were imposed on customers’ ability to rapidly vary the size of their investment in the pool. Since the crisis, the New York Fed has continued to provide the pool as a service. Investments in the pool continue to be paid the market-based rate I mentioned. Figure 16 contains some statistics on this rate relative to a measure of the broad market rate. We do not use the foreign pool as a means for implementing monetary policy, and the change in the composition of Federal Reserve liabilities it can generate has little to no impact in unsecured markets because of the large amount of reserves in the system. Recall that the current operating framework is not based on reserves scarcity. Use of the foreign pool has grown over the last year and a half, from a bit under $100 billion in mid-2014 to about $247 billion on February 17. This growth isn’t associated with liftoff, and it isn’t because we have changed the way in which the interest rate is calculated. Instead, use of the pool has increased because over time the constraints imposed on customers’ ability to vary the size of their investments have been removed, the supply of balance sheet offered by the private sector to foreign central banks appears to have declined, and some central banks desire to maintain robust dollar liquidity buffers. Compared with the relative calm of the pre-crisis period, money markets have recently gone through a sustained period of substantial change. Some of these changes are the result of regulations to improve the safety and soundness of the financial system, others relate to business model enhancements, and, of course, some relate to Federal Reserve activity. The Federal Reserve continues to collect data on the structure of money markets to determine whether any changes are needed in its operating framework to ensure that its objectives continue to be met. We are continuing to watch developments as business models adapt to the numerous changes in bank regulation introduced over the past few years. We are interested in the extent to which these business model changes impact the structure of money markets and thereby affect the form of monetary policy implementation. For example, we are monitoring developments in bank behavior that could have implications for the transmission of monetary policy into market rates. Thus, we are paying close attention to the behavior of foreign banks on financial statement reporting dates. We are also keeping a close eye on how domestic banks continue to respond to enhanced requirements on nonoperating deposits, which, for some institutions, are fairly large relative to the size of their reserve holdings. Should these business model changes increase the spread banks demand to borrow funds in money markets to earn IOR, or should business model decisions apparently related to regulatory changes alter broader dynamics in money markets, this could result in upward pressure on ON RRP take-up over time. We are also paying close attention to developments in the money market mutual fund industry and their potential impact on policy implementation.48 The Securities and Exchange Commission recently announced new regulations for these funds aimed at enhancing financial stability. One important feature of these new rules is that government-only money funds receive different regulatory treatment than prime funds, possibly making government-only funds more attractive for some institutional investors. If the assets under management in government-only money funds were to grow significantly, that could put upward pressure on ON RRP take-up, since most fund managers consider the facility to be a government investment.49 As I noted earlier, we would not want to see growth in government-only money funds if it were predicated on a mistaken impression that ON RRP would be around indefinitely and with high capacity. Also, if assets under management in prime funds were to decline sharply, this could possibly lead to less efficient transmission of monetary policy. Finally, we want to keep an eye on relative value relationships in money markets. For example, the difference between customer-to-dealer and interdealer repo rates has been quite volatile in recent months, apparently because of growth in dealer balance sheet costs. To summarize, in the period since liftoff, we have achieved excellent control over the effective federal funds rate, and we have done so while avoiding unintended effects on the financial system or financial stability. The policy rate increase has passed through to other money market rates, suggesting that the increase is affecting broader financial conditions as expected and intended. We still have a lot of work to do, both to observe ongoing structural changes in financial markets and to formulate and implement any necessary response in the Federal Reserve’s monetary policy operations. I believe we have thoughtfully considered these uncertainties, and I am confident that we have appropriate policy tools available to respond as necessary to them. Thank you. I would be happy to take a few questions. 1 I would like to thank James Egelhof and Patricia Zobel for their excellent assistance in the preparation of these remarks, and colleagues in the Federal Reserve System for numerous insightful comments and suggestions. In addition, I would like to acknowledge the leadership of James Clouse, William English, and Lorie Logan in the construction of this new framework and James McAndrews for his intellectual leadership on U.S. money markets. 2 For more details on implementation frameworks, see for example Ihrig, Meade, and Weinbach (2015). 3 With the commencement of the policy normalization process in December 2015, the Federal Reserve began issuing an implementation note that provides the operational settings of the Federal Reserve's policy tools. This note serves to separate communications about the policy stance from those about policy implementation. It also promotes greater cohesion and transparency in communications about policy implementation by consolidating information that was previously provided in FOMC statements, FOMC minutes, Desk statements, and elsewhere. 4 An estimated historical series for an effective federal funds rate, produced using the new data source and calculation methodology, is available on the New York Fed’s website. This series will be updated at the end of February. 5 Demand for loans of reserves was driven, for example, by reserve requirements imposed on depository institutions. 6 I emphasize “all else equal.” There were many subtleties to the pre-crisis relationship between the operations and money market rates. In particular, money market rates would often move to a new target rate even before operations were conducted, because of the Federal Reserve’s credibility. Of course, that credibility was underpinned by the Federal Reserve’s actual operational capability. For a detailed exposition on pre-crisis monetary policy implementation, see Bernanke, “Implementing Monetary Policy,” March 30, 2005. 7 Of course, the Desk also controlled the level of reserves through permanent open market operations. 8 When the Desk conducts a reverse repo transaction, it sells securities held in the System Open Market Account (SOMA) under an agreement to repurchase the securities at a predetermined price. The difference between the sale price and the repurchase price, together with the length of time between the two legs of the transaction, implies a rate of interest (the reverse repo rate) paid by the Federal Reserve to its counterparty. The transaction leaves the size of the SOMA securities portfolio unchanged but shifts some of the liabilities on the Fed’s balance sheet from bank reserves to reverse repos while the trade is outstanding. A repo (as opposed to a reverse repo) is the opposite. Before the crisis, repos were more common than reverse repos. 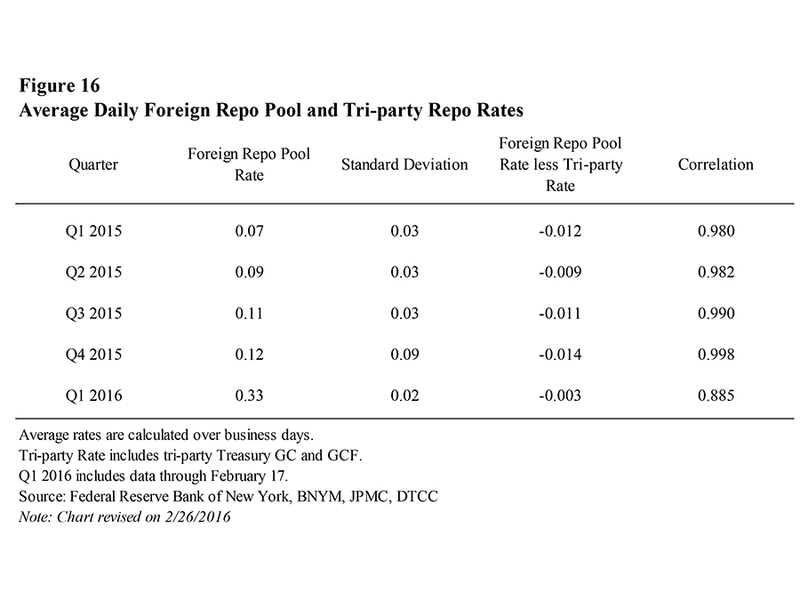 The eligible collateral for the Desk’s repo and reverse repo operations is set forth in the FOMC’s Authorization for Domestic Open Market Operations. 9 Autonomous factors are those components of the Federal Reserve’s balance sheet that affect reserve balances but are not directly under the central bank’s control. The largest of these, by far, is currency in circulation. Others include U.S. Treasury deposits, Federal Reserve Bank “float,” and overnight reverse repos conducted with foreign central banks. See, for example, Hilton (2008). 10 The 2005 speech by then-Governor Bernanke that I noted earlier provides great detail on a day in the life on the Desk prior to the financial crisis. 11 Congress granted this authority to the Federal Reserve in the Financial Services Regulatory Relief Act of 2006, with an October 2011 effective date, but accelerated its implementation to October 2008 as part of the legislative response to the financial crisis. A similar tool is critical in the implementation regime of most advanced economy central banks. 12 The FOMC also considered an arrangement under which depository institutions could pledge funds held in a segregated account at the Federal Reserve as collateral in borrowing transactions with private creditors. This approach aimed to reduce credit-related barriers to depository institutions’ borrowing funds in money markets and thereby intensify competition among borrowers. The FOMC decided that these accounts involved operational, regulatory, and policy issues that would have been difficult to resolve in a timely fashion, and it shelved further work. See the minutes to the FOMC’s December 2014 meeting. 13 This approach was discussed in detail in the FOMC’s June 2011 Exit Strategy Principles. 14 The Federal Reserve continues to test its Term Deposit Facility (TDF). In late 2014 and early 2015, the Federal Reserve conducted rounds of testing of the TDF that on two occasions resulted in cumulative take-up of more than $400 billion. These operations reportedly had no significant impact on conditions in money markets, suggesting that TDF operations would have to be significantly larger to put upward pressure on rates. 15 This approach has been used heavily, for example, by central banks that have large foreign exchange reserves. 16 In July 2015, the FOMC announced that changes in administered rates would go into effect on the day after its policy decision. Otherwise, the intraday timing of a policy change could result in various operations being conducted with inconsistent settings. 17 ON RRP is currently offered to a broad set of counterparties; these counterparties make up a fairly large proportion of the lending community in overnight money markets. By offering this large group of counterparties an alternative, risk-free investment option, ON RRP should improve lenders’ market power and help keep money market rates near or above the ON RRP offered rate. Even if money markets were perfectly competitive, ON RRP would likely still be effective at supporting the floor provided by IOR, for example through addressing segmentation between secured and unsecured money markets. 18 The preservation of enough activity in the federal funds market to maintain the viability of the effective federal funds rate was one component of this. 19 A final operational change to improve the transmission of IOR into market rates was a revision to the interest calculation methodology that became effective in July 2015. As originally implemented, interest on excess reserves (IOER) was paid on each bank’s average balances over a two-week maintenance period, at the average interest rate. This meant that if the interest rate changed during a maintenance period, the change would not have been fully reflected in the interest payments to depository institutions until the beginning of a new maintenance period. This methodology likely would have resulted in slow adjustment of market rates to changes in the IOER rate. The revised calculation bases interest payments to depository institutions on the IOER rate in effect each day and the level of balances held each day. 20 See Clouse, Ihrig, Klee, and Chen, “The Federal Reserve’s Tools for Policy Normalization in a Preferred Habitat Model of Financial Markets,” October 2014; Martin, McAndrews, Palida, and Skeie, “Federal Reserve Tools for Managing Rates and Reserves,” September 2013; and Armenter and Lester, “Excess Reserves and Monetary Policy Normalization,” September 2015. 21 Testing focused on two types of term operations. Term RRPs are similar to ON RRP in most respects; for example, both operations use the same expanded set of counterparties. The key differences are that term RRPs are conducted for longer than overnight, they each have their own, separate, aggregate capacity limit, and the term RRP does not incorporate a per-counterparty cap. Term RRPs can be used in a variety of ways. In the current framework, they have been used to offer increased RRP capacity, using an interest-rate-oriented approach, around periods when larger-than-usual demand is expected, but they could also be used in a quantity-oriented way to drain reserves. Term deposits are likewise similar to IOR; TDF offers a somewhat higher rate to banks that are willing to lock up their funds for a time. 22 The FOMC’s decision to use a target range for the federal funds rate, instead of a point target as was used prior to December 2008, further supported the use of this operating framework. The FOMC’s use of a range supports this framework by underscoring the fact that variation of the effective rate within that range is expected and is consistent with the level of interest rate control it desires. 23 Frost, Logan, Martin, McCabe, Natalucci, and Remache, “Overnight RRP Operations as a Monetary Policy Tool: Some Design Considerations,” February 2015. 24 It seems particularly appropriate to pay close attention to the integration of money markets in light of the increase in bank and dealer balance sheet costs that has ensued from post-crisis changes in financial regulations and other factors. 26 See the September 2014 Policy Normalization Principles and Plans. 27 It is possible that the ON RRP facility might, in certain circumstances, have beneficial effects on financial stability by providing confidence that there will be an elastic supply of risk-free assets available to nonbanks. 28 “Statement Regarding Planned Changes to the Calculation of the Federal Funds Effective Rate and the Publication of an Overnight Bank Funding Rate,” February 2, 2015. 29 “Statement Regarding the Calculation Methodology for the Effective Federal Funds Rate and Overnight Bank Funding Rate,” July 8, 2015. 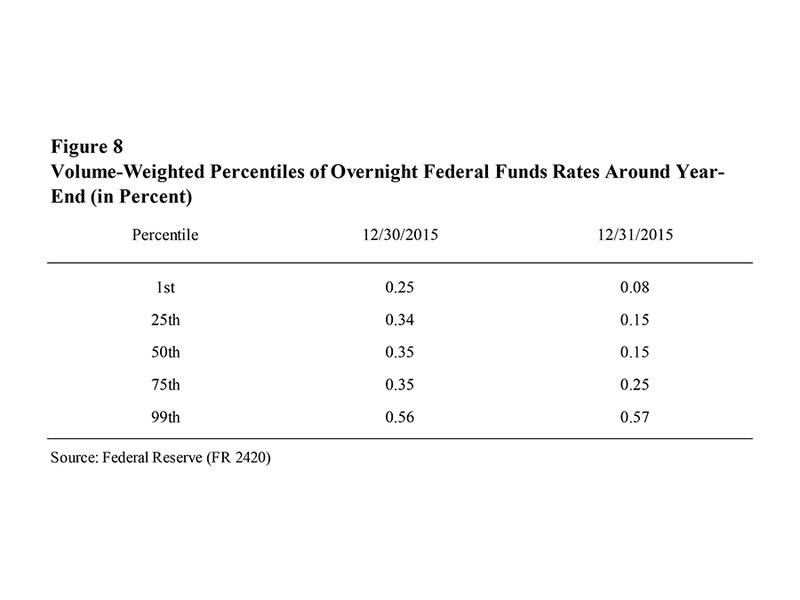 30 “Technical Note Concerning the Methodology for Calculating the Effective Federal Funds Rate,” July 8, 2015. 31 Eurodollars are unsecured U.S. dollar deposits held at a bank or bank branch outside of the United States or domestically through an international banking facility (IBF), whereas federal funds are domestic borrowings by U.S. banks and U.S. branches and agencies of foreign banking organizations (FBOs). Although the Federal Reserve can impose reserve requirements on net Eurodollar deposits of U.S.-based banks, it has imposed a zero reserve requirement since 1990, making the treatment of Eurodollar deposits effectively the same as federal funds borrowings. 32 Since revisions were implemented to the FR 2420 on October 20, 2015, both domestic banks and FBOs have been required to report Eurodollar transactions on the FR 2420. Domestic banks report the activity of all offshore branches with more than $2 billion in assets, while FBOs report activity of offshore branches that are managed and controlled by offices based in the United States. Additionally, both domestic banks and FBOs report the activity of their IBFs. Prior to the revisions, only domestic banks reported Eurodollar transactions, and there was no reporting by IBFs. 33 In addition to enhancing the Eurodollar collection, the revised reporting instructions, effective October 20, 2015, modified and clarified the definition of federal funds transactions and expanded the number of reporting entities. The effect of these changes was an increase in the amount of reported federal funds activity. 34 The data file for this speech, available on the New York Fed’s website, includes a historical calculation of the OBFR based on data provided by federal funds and Eurodollar brokers until October 19, 2015 and based on FR 2420 data, from October 20th, 2015 until February 17th, 2016. 35 See “Responses to Survey of Primary Dealers,” December 2015, and “Responses to Survey of Market Participants,” December 2015. 36 One such exceptional period was in mid-October 2015, amid some market concern about the debt ceiling that eventually abated. 37 The Treasury has recently begun to ramp up its issuance of Treasury bills in part to support the maintenance of a larger cash balance, which it keeps in its “checking account” at the Federal Reserve. This action increases the amount of Treasury bills in circulation, thereby creating a greater stock of investible assets for nonbank money market investors—an outcome that tends to put upward pressure on Treasury bill rates and potentially other term money market rates. 38 Domestic depository institutions are subject to a regulatory leverage ratio that is calculated as an average over the quarter and thus experience less variation in balance sheet costs at the end of quarters. 39 The Federal Home Loan Banks (FHLBs) are one type of institution that requires this feature for some of their cash holdings. Prior to liftoff, the FHLBs, which have access to unremunerated deposit accounts at the Federal Reserve, were able to use this to support their negotiating position with borrowers at quarter-ends, but now with rates further above zero it is less effective in this regard. 40 ON RRP does not always provide a completely firm floor on the tri-party repo market. For example, late-day funds can generate some softness. Also, there is evidence that some lenders in repo markets are reluctant to frequently switch their counterparties. However, ON RRP is otherwise a close substitute to repo with a private counterparty. In particular, since all tri-party repo is unwound at the same time, there is no possibility of early return of funds, which, as I mentioned earlier, is a significant benefit some federal funds and Eurodollar borrowers are able to offer. 41 Prime funds’ share of participation is significantly larger on quarter-end dates. 42 A small number of financial market commentators had opined that use of the tri-party repo infrastructure for the ON RRP facility would make it harder for market participants to borrow the Federal Reserve’s Treasuries in securities lending to facilitate settlement, and therefore result in less liquid Treasury markets. However, use of the Federal Reserve’s securities lending program has been stable since liftoff, suggesting that the design of the ON RRP facility has thus far not contributed to any increase in the scarcity of specific Treasury collateral. 43 If the total amount of propositions received is less than or equal to the amount of available securities, awards are made at the specified offering rate to all counterparties that submit propositions. In the event that the value of propositions received exceeds the ON RRP’s capacity, awards are made at the rate at which the capacity was achieved (the stop-out rate), with all propositions below this rate awarded in full and all propositions equal to this rate awarded on a pro rata basis. The stop-out rate, which can be any value at or below the specified offering rate (including a negative rate), is determined by evaluating all propositions in ascending order by submitted rate up to the point at which the total quantity of propositions equals the overall size limit. The ON RRP FAQs provide more information on the auction mechanism. 44 In September 2014, money market rates were soft for several days going into quarter-end, as market participants anticipated that the ON RRP would reach its aggregate capacity on that day. According to market participants, money market lenders lent overnight funds well in advance of quarter-end at rates below the ON RRP rate to informally secure balance sheet capacity for the quarter-end date. 46 Other major central banks provide analogous services. In managing the foreign reserves of the United States, the Federal Reserve avails itself of these services when appropriate. 47 As a result, the rate paid on the pool closely tracked the interest rate achieved on temporary open market operations. 48 We are also monitoring developments in money fund net yields versus retail bank deposit rates. Money fund management fees declined considerably as interest rates fell to near-zero levels, apparently as fund managers worked to preserve a non-negative yield for their investors. Net interest margins at banks were also compressed. It is natural to expect that this compression in margins, both at money funds and at banks, will reverse as rates move away from zero, but the magnitude and timing of this reversal in margin compression may vary among these two investment types. We are watching closely to see whether there is a shift in relative pricing between them that could produce a flow from one to the other and thereby have implications for the structure of financial intermediation. 49 Assets under management in government-only funds could grow two ways: Prime funds could convert into government-only funds, or prime fund investors could transfer their money into government funds. Most prime funds have announced their intentions at this point, and among those that have converted to government funds, take-up has not markedly increased, so therefore we are less concerned about such conversions, but we continue to pay close attention to them, as we do to investor behavior.